Home » Akhenaten: Who Was This Mysterious Egyptian Pharaoh? Akhenaten: Who Was This Mysterious Egyptian Pharaoh? convention. In his first year, he built a Temple dedicated to the Aten at the perimeter of the Temple of Amun at Karnak. He took the unconventional step of celebrating a Sed-festival in his third year (this festival was usually conducted in the thirtieth year of a Pharaoh’s reign) but still presented the Aten as a variant of Amun-Ra. the mansion of the Aten”) where the royal family lived during the winter months. Pharaoh Akhenaten died in his seventeenth year on the throne and his reforms did not survive for much longer. His coregent and successor Smenkhare, died after a short reign and power passed to the boy king, Tutankhamun (originally Tutankhaten). During his reign the city of Akhetaten was abandoned and Amun and the other gods were reinstated. Once the “Atenist heresy” had been discredited, Akhenaten’s image and names were chiseled from his monuments and his sun temples were dismantled. His glorious city crumbled back into the desert and his name (and that of his two immediate successors) was left out of the Kings lists produced shortly after. Egyptian religion to establish a connection with one God, the Aten. To some, Akhenaten was the first Monotheist who may have been inspired by Joseph or Moses. However, it is by no means as simple as that. Although Akhenaten’s religion did center on one god, it was not strictly monotheistic and was by no means identical to the Israelites. It seems that the Apis cult was maintained and other gods are still mentioned in inscriptions (although they are usually solar gods or personifications of abstract ideas). In fact, the names of the Aten (which were written in a cartouche) describe the god in terms of the other gods. Other theorists (such as Bob Brier) have suggested that the king actually suffered from Marfan’s syndrome. Many sufferers have a long face, slender tapered fingers, long arms and legs, and a curvature of the spine. However, the disease does not affect intelligence or fertility. Marfan’s syndrome is hereditary, and could help explain the high mortality rate within the family. Three of his daughters, and his co-regent Smenkhkare all died young. However, Tutankhamun, does not appear to have suffered from the condition. This could be explained if Tutankhamun was not his son, but then, who was his father? Proponents of the view that Akhenaten was physically disabled note that he was barely mentioned during his father’s reign and suggest that he was hidden away because of his deformity. 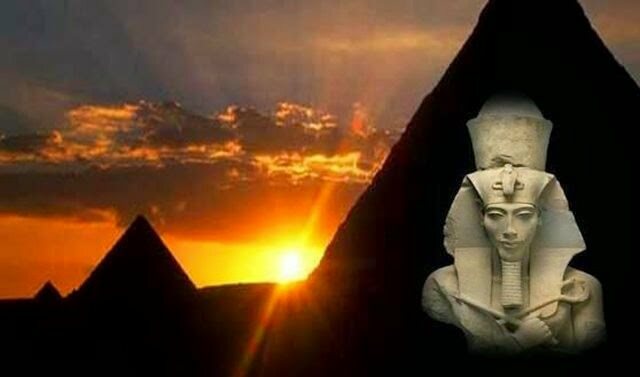 However, it was fairly common for the male offspring of the king to remain in the shadows until they held a position of specific importance, such as heir or co-regent, and Thuthmosis (Akhenaten’s elder brother) was the first choice as heir. Akhenaten only rose to importance when his brother died.